Yet another data visualization/infographic (that line is so very fine) that I made this year. 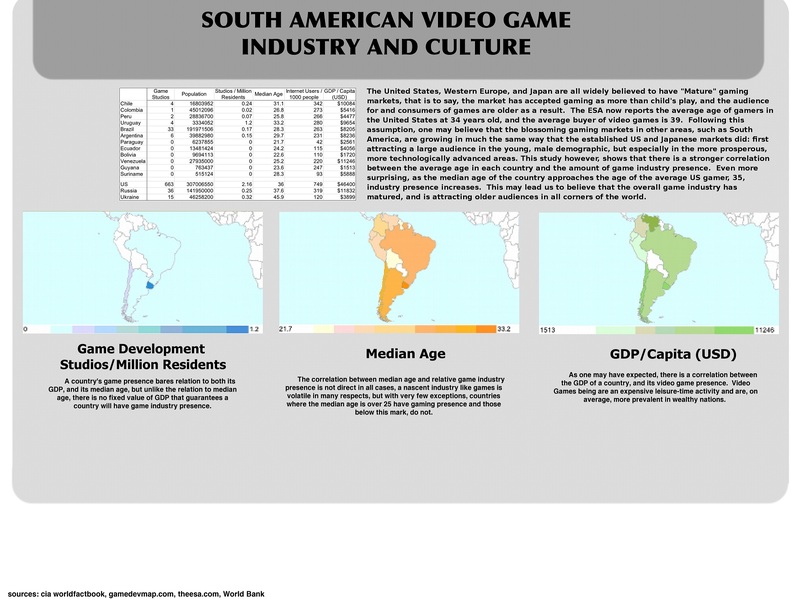 This one is relating the maturity of the South American video games industry with the maturity of national economy, and of average age. It is a very obscure topic, but the relationship was quite striking when I first saw it. I’ve always had an interest in the games industry of undeveloped regions of the world or even those regions not known for their video games, so I really picked a great topic for myself and took quite fondly to the research. I’ve presented a number of heat-maps of the continent with different information. If you are a gamer or you have purchased a lot of boxed games then you probably noticed the layout is almost exactly what you would see on the back of a video game case: A bold title with in depth information in one paragraph or three horizontal images with captions. If I had made every single caption end with ellipses I might just have been able to market it, haha. You can get to the “Big” link here or by following the trail on the image above.